To begin, let me say how honored and humbled I am to be selected to lead such a fine group of dedicated Veterans. I hope I can live up to your expectations, and possibly exceed some. The most influential book I have ever read was actually read to me when I was too young to read it myself. “If Everybody Did” stuck to me from a very early age: What if everybody stood on Dad’s feet? What if everybody picked the buds off the flowers? What if everybody left their toys on the stairs? But that question goes both ways. What if everybody was a little kinder? What if everybody was a little more patient? 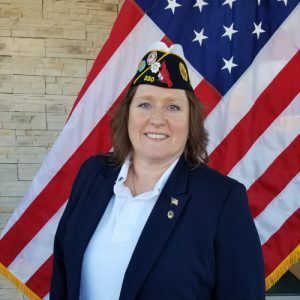 I’m not asking for any ONE person to “do it all” but what if everybody did just one more thing for the American Legion – one more member recruit, one more contribution to Post newsletters and Facebook posts, one more member to sit in on Boys State interviews, one more person to drive a Veteran to an appointment? And really, just attend one more fundraiser dinner at a neighboring Post. It’s simplistic to say, “No single raindrop is responsible for the flood” but there’s truth in that. GOALS: So obviously, my goals include trying to replicate last year’s membership achievements and to help Department Commander, Tom Queck, reach 100% for the 100 Years of Service. But more than just numbers, I want us to have fun, work together and continue to make the American Legion an organization to be proud of, to boastfully brag about. Next, I’d love for members to visit each other’s Post, get to know one another, and maybe get ideas from each other. Therefore, I ask for you to keep us informed of any of your Post functions and activities. We will put it on the website calendar for the District. One quick reminder – all Post Commanders are part of the District Executive Committee and all other members are invited to attend District, Department, and National meetings. We all have a shared history and a common goal so let’s continue to foster comradery.